Title "Student War Protest Gets Faculty's Blessing"
Description Newspaper article describing the IU Faculty Council's decision to support the students' right to peaceful protest on the upcoming Vietnam Moratorium Day. In light of past events when students had faced punishment for "disrupting campus activities" there had been some uncertainty over whether students would face similar penalties for continued anti-war protests. 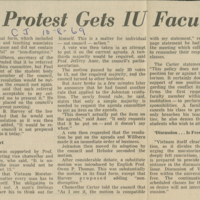 Louisville Courier-Journal, “"Student War Protest Gets Faculty's Blessing",” Indiana University Archives Exhibits, accessed April 19, 2019, http://collections.libraries.indiana.edu/iubarchives/items/show/444.